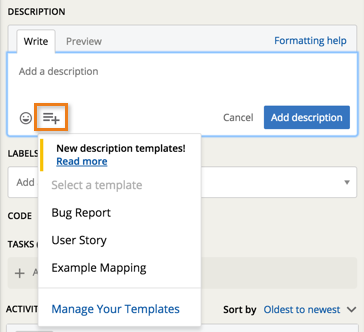 Tracker recently introduced story description templates that allowed users to add one of three default templates to a story description: Bug Report, User Story, and Example Mapping. Since then, we’ve received an overwhelming amount of feedback from our customers requesting the ability to create their own custom templates. Though we strongly expected this would be the case, we wanted to put out the MVP version first and make our next move solely based on your feedback. We heard you loud and clear and are happy to announce that custom description templates are here! From the STORIES page, click the MORE tab from the top navigation menu (alternatively, edit a story description, click on the story template icon, then select Manage Your Templates). Select Manage Templates from the sidebar on the left. Click Add Template. Use Markdown to customize the template to your liking. Click Preview at any time to ensure the template is formatted correctly. Note: The Markdown preview ability didn’t make it in today’s release; however, it will be pushed out very soon! Select the desired template from the list. Edit the template as needed, making sure to click Save Template when done, or click Delete Template if you wish to permanently remove this template. Custom description templates are unique to the projects they were created in. Any project member or owner can create and use description templates within the project. There are no limits to how many templates you can create. Thanks to everyone who took the time to provide feedback on story description templates, and please keep that feedback coming—you can submit it using the Provide Feedback widget under Help in any project, via Twitter, or by emailing us.